MALDIPepQuant is a tool to quantify MALDI peptides (SILAC) from Phenyx output. 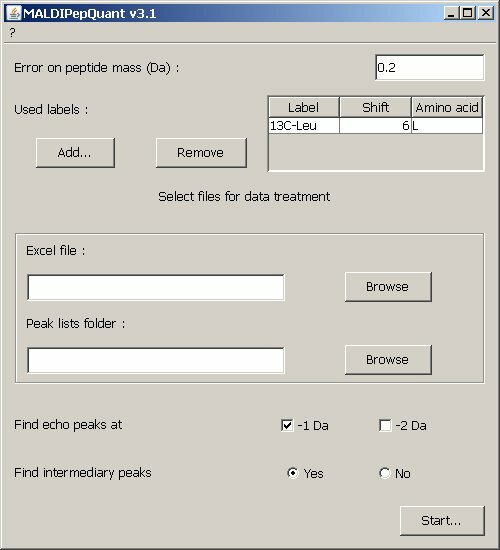 This tool has been developed as a service of the Bioinformatics Core Facility for Proteomics, within a collaboration between the Proteome Informatics Group from the Swiss Institute of Bioinformatics (SIB) and the Biomedical Proteomics Research Group (BPRG). MALDIPepQuant	v3.1 is	written	in Java	1.5, using the Java Swing technology for its Graphical User Interface. PDF version of the full	text is	available on the Applied And Environmental Microbiology web site. The Java Web Start technology can be used to run	MALDIPepQuant directly from	the ExPASy website. Be sure to have at least version 1.5 of Java Runtime Environment (JRE) installed on your computer. Otherwise, you can download the	latest version from	the Sun	website. It has been fully tested on Windows 2000/XP (Firefox 2.0, IE 6.0), Linux (Firefox 2.0), Mac OS X (Safari 3.0). Do not hesitate to contact us with your configuration (OS & browser name and version) if you encountered some troubles. Download one of the test sets and extract it. After extraction, you can use the files as parameters for MALDIPepQuant as specified in the help page. By following this link you may download the complete	source code of MALDIPepQuant, including	Java source code, libraries, and build file. This distribution also contains the help page of MALDIPepQuant.